One of the major coverage provisions of the 2010 Affordable Care Act (ACA) is the expansion of Medicaid eligibility to nearly all low-income individuals with incomes at or below 138 percent of poverty (about $16,000 for an individual) This expansion fills in historical gaps in Medicaid eligibility for adults and was envisioned as the vehicle for extending insurance coverage to low-income individuals, with premium tax credits for Marketplace coverage serving as the vehicle for covering people with moderate incomes. While the Medicaid expansion was intended to be national, the June 2012 Supreme Court ruling made it optional for states, and as of December 2013, 25 states are not expanding their programs. Medicaid eligibility for adults in states not expanding their programs is quite limited -- the median income limit for parents in 2014 will be 47% of poverty, or an annual income of about $9,200 a year for a family of three, and in nearly all states not expanding, childless adults will remain ineligible. Further, because the ACA envisioned low-income people receiving coverage through Medicaid, it does not provide financial assistance to people below poverty for other coverage options. As a result, in states that do not expand Medicaid, many adults will fall into a "coverage gap" of having incomes above Medicaid eligibility limits but below the lower limit for Marketplace premium tax credits. Nationwide, nearly five million poor uninsured adults are in this situation. 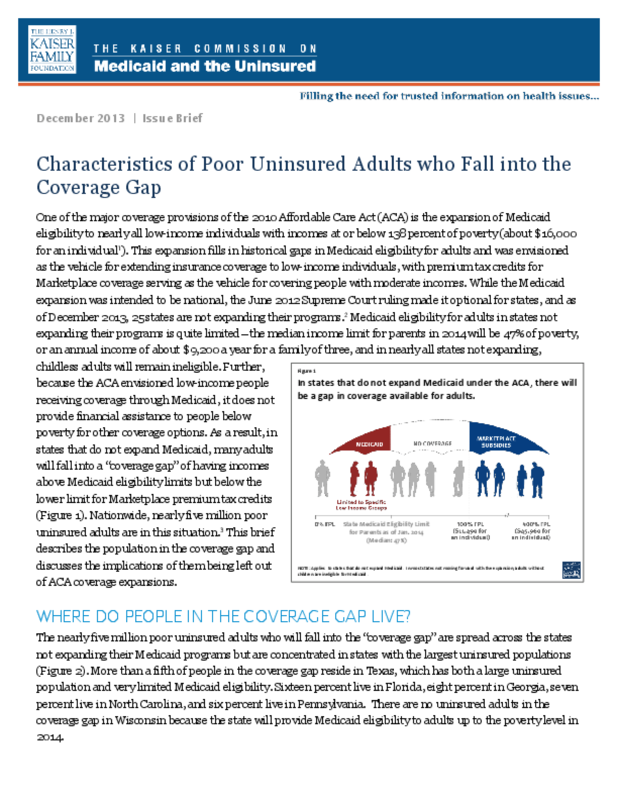 This brief describes the population in the coverage gap and discusses the implications of them being left out of ACA coverage expansions. Copyright 2013 Kaiser Commission on Medicaid and the Uninsured.